http://christchurchtashua.com/img_6854/ http://alannahlh.com/about-me/ John Dury New was born on August 12, 1924 in Mobile, Alabama. He was just 17 years old on Sunday, December 7, 1941 when the Japanese attacked Pearl Harbor. The following day, he was the very first man from Mobile to volunteer and enlist in the United States Marine Corps to go fight our Japanese enemy. He began his recruit training just four days later, and by October 1942 was a member of the 2nd Battalion, 7th Marine Regiment fighting in the Guadalcanal Campaign as part of the 1st Marine Division. New survived Guadalcanal, and then fought with 2/7 Marines and the 1st Marine Division on Cape Gloucester. After that battle, the division prepared for their next assault: the attack on Peleliu which began on September 15, 1944. On the tenth day of the battle, the Marines ashore on Peleliu still faced intense Japanese resistance with the enemy dug in deep into the center hills of the island. Private First Class New was manning an observation post on one of the hillsides with two other Marines when an enemy soldier came out of hiding and threw a grenade in their midst. In that split-second, New decided to smother the grenade with his own body and thereby saved the lives of his two comrades so they could carry on their vital mission of directing mortar fire at the enemy. Citation: For conspicuous gallantry and intrepidity at the risk of his life above and beyond the call of duty while serving with the 2d Battalion, 7th Marines, 1st Marine Division, in action against enemy Japanese forces on Peleliu Island, Palau Group, 25 September 1944. When a Japanese soldier emerged from a cave in a cliff directly below an observation post and suddenly hurled a grenade into the position from which 2 of our men were directing mortar fire against enemy emplacements, Pfc. New instantly perceived the dire peril to the other marines and, with utter disregard for his own safety, unhesitatingly flung himself upon the grenade and absorbed the full impact of the explosion, thus saving the lives of the 2 observers. Pfc. New’s great personal valor and selfless conduct in the face of almost certain death reflect the highest credit upon himself and the U.S. Naval Service. He gallantly gave his life for his country. 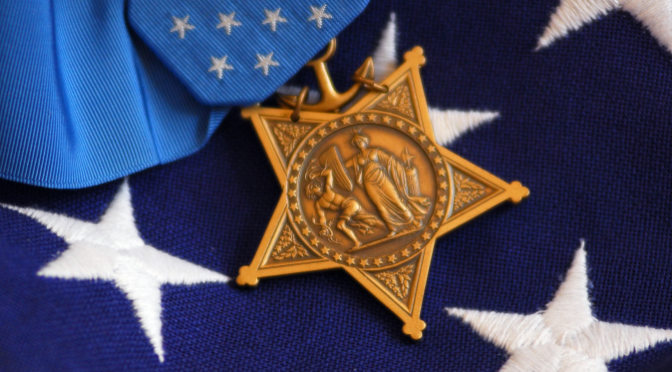 PFC New’s Medal of Honor was presented to his father by Rear Admiral Charles A. Pownall, United States Navy in 1945. In April of 1946, the Navy commissioned the USS New (DD-818), named in the young Marine’s honor and memory. His sisters Mary and Barbara, the latter the New‘s sponsor, were present at her commissioning. Miss Mary New (left) and Mrs. Barbara Julien with the Executive and Commanding Officers of the ship named for their brother. The New served with our Navy until 1976. The ship later served with the Republic of Korea Navy and was decommissioned in 2001. John New was initially buried in a cemetery on Peleliu. His remains were repatriated to the United States and laid to their final rest in the Mobile National Cemetery during 1948. 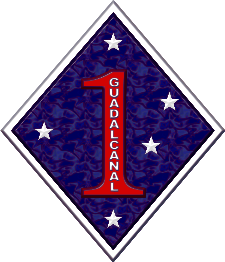 2nd Battalion, 7th Marine Regiment persists as a component of the 1st Marine Division. Their home station is the Marine Corps Air Ground Combat Center, Twentynine Palms, California.